ULISSE RADICAL is the first Videotec ready to use network Full HD PTZ camera system that integrates exceptional factory-assembled combinations of camera and lens, Full HD 1080p, 60fps and 1/2" CMOS sensor, for day and night time broadcast quality video of extended outdoor areas. To meet the most demanding video surveillance specifications, this PTZ camera unit is supplied with 18x or 33x lenses equipped with an advanced autofocus that allows and automatically maintains the focus on subjects at far distances with sharp details. ULISSE RADICAL is certified ONVIF Profile S and is compatible with most VMS on the market. The Videotec's PTZ ASSISTANT plug-in software supports any VMS with the control of all special functions such as wiper, washer pump, IR and Auto Focus. Powerful motors guarantee exceptionally smooth tracking, even at a minimum speed of 0.02°/sec. The performance remains optimal in complete darkness thanks to powerful LED illuminators that can reach distances of over 300m (985ft) with two UPTIRN illuminators (10°, 850nm). ULISSE RADICAL with 33x zoom features a Thermal Compensation System and a Visible Cut Filter. 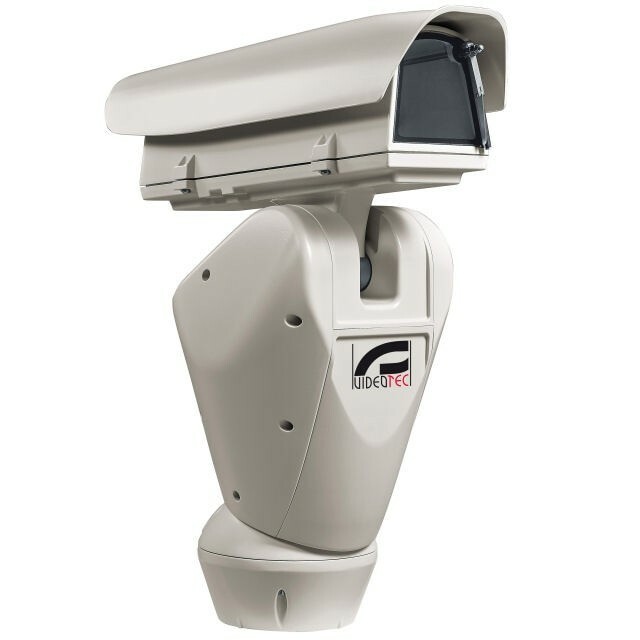 Due to its characteristics of accuracy, reliability and robustness, this PTZ camera is the ideal solution for the visual control of large outdoor areas, such as: border patrol, harbour surveillance, long distance perimeter surveillance, traffic and highway control, military installations.